Beuerlein was chosen by the Raiders in the fourth round of the 1987 NFL draft. A drop-back passer with a good arm and limited mobility, he started 15 games in his first two years with modest results. He held out prior to the 1990 season, which soured the Raiders on him and, after not being activated for any games that year, Beuerlein was traded to Dallas. When starting QB Troy Aikman was injured in ’91, Beuerlein started the season’s last four games, all wins, plus another victory in the postseason (the only one of his career). He backed up Aikman in 1992 and then moved on to the Cardinals, where he started in 1993 and passed for 3164 yards and 18 TDs, with 17 interceptions, but clashed with Head Coach Buddy Ryan in ’94 and had a lesser year. Beuerlein was chosen by the Jacksonville Jaguars in the 1995 expansion draft and was that franchise’s first starting quarterback, but lost out to Mark Brunell and was dealt to Carolina, where he initially backed up Kerry Collins in 1996 and ‘97. He took over for Collins in 1998 and completed a career-high 63.0 percent of his passes while throwing for 2613 yards and 17 TDs. Panthers went 8-8 to finish second in the NFC West. After his big year in 1999, Beuerlein had a lesser performance with a losing team in 2000, passing for 3730 yards and 19 touchdowns while giving up a career-high 18 interceptions. He was released by the Panthers and moved on to Denver, where he was inactive for all of 2001 due to an elbow injury that required surgery. He spent two more years with the Broncos, coaxed back by Head Coach Mike Shanahan for the last one in 2003, and brought savvy into his role as backup. 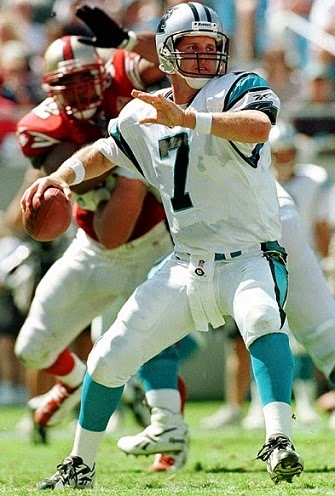 Overall, Beuerlein lasted a total of 16 seasons, passing for 24,046 yards and 147 touchdowns, with most of his starts (51) coming with the Panthers, where he completed 60.4 percent of his passes for 12,690 yards and 86 TDs while giving up 50 interceptions. Tough and an able passer, his lack of mobility was a key limiting factor.